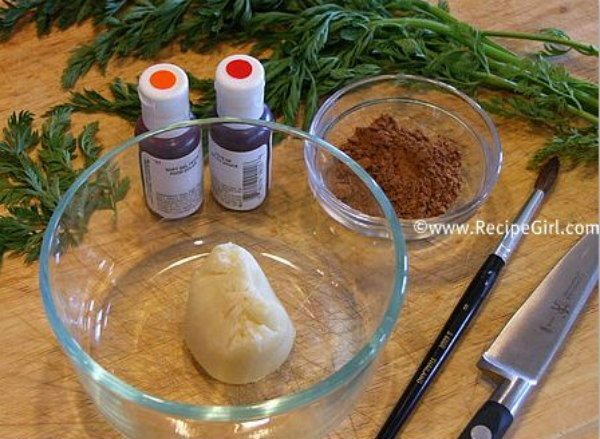 Here’s an easy tutorial showing you How to Make Marzipan Carrots. I do my best thinking when I’m exercising. 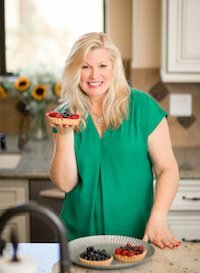 I’m proud of my ability to multi-task… working hard to whittle down my thighs while planning to make various recipes by scouring through cooking magazines at the gym. I always over-plan. 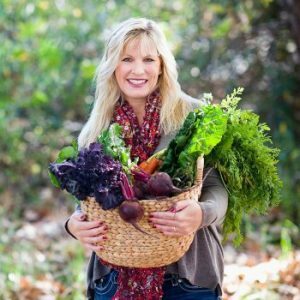 During a recent 45 minute workout, I mentally planned several 30-minute-or- less dinners, learned how to make hot cross buns for Easter, decided on a quiche and salad for lunch, discovered how to pickle vegetables, selected my Easter brunch menu, and gained inspiration for a Cuban dinner party. But the how-to I was most excited to dig into was Martha Stewart’s explanation on how to make Marzipan Carrots. Marzipan is sold in the baking aisle of most markets. It’s a soft, pliable mixture of almond paste and sugar. 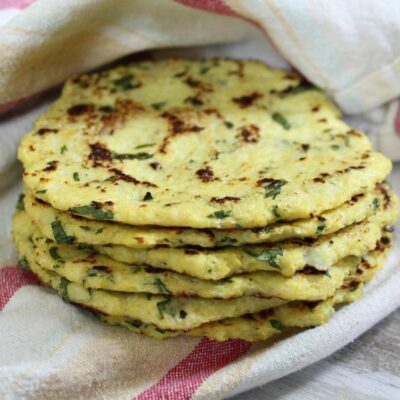 Bakers often color it, form it into shapes, and use it as decor on their baked goods. 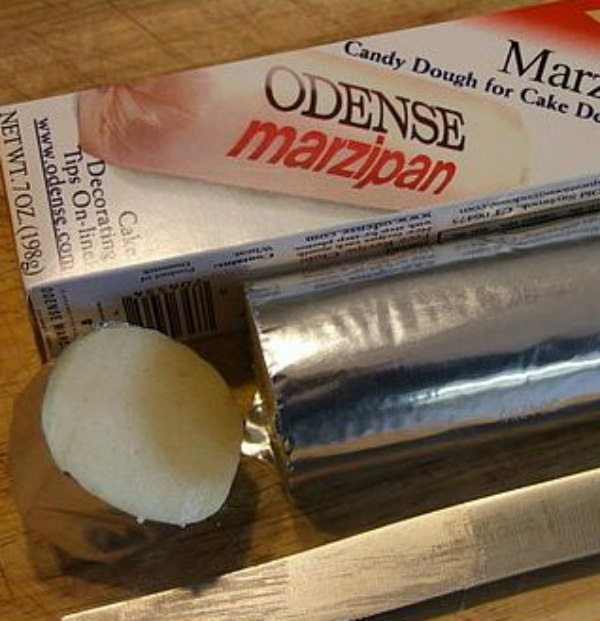 I’ve seen this sort of confection before- marzipan, and I always figured it was too much of a pain to try and do something with it. For the record, it’s not difficult to work with, and it is much like playing with playdough. 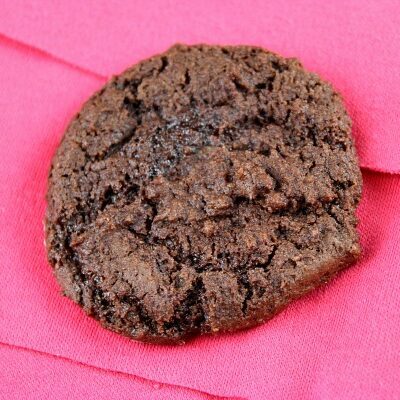 You need marzipan, gel-paste coloring (LOTS easier to work with than regular liquid food coloring- find it at craft or baking stores), cocoa and carrot fronds (the greens). Mix a few drops of the gel-paste coloring with the marzipan. 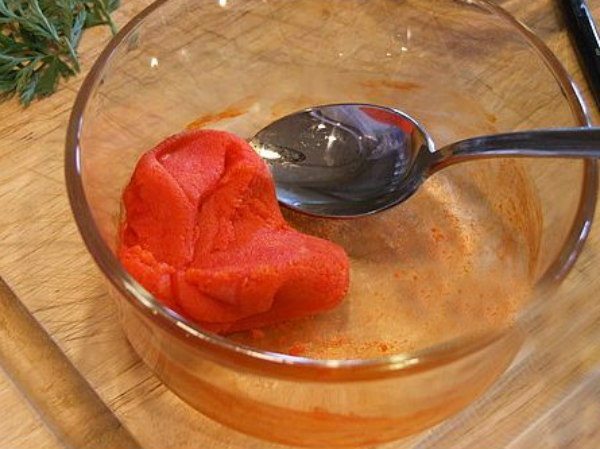 Work it in with a spoon until you get the desired carrot color you’re looking for. Separate the colored marzipan into 12 pieces and roll into carrot-shapes with one end tapered. Always keep marzipan covered or kept in a zip bag until you’re ready to work with it (dries out quickly). Tear off some carrot fronds to use for the tops of your carrots. Dampen a small knife and dip the edge in cocoa. Carefully make indentations with the cocoa-dipped knife on the marzipan carrot shapes (to simulate a real carrot, ‘just-picked’ look). You can also take a little brush and brush on the cocoa instead. At this point you can keep your almost-finished carrots in a little ziploc baggie until you’re ready to use them. Just before placing them as decor, slip small pieces of carrot fronds into the ends by making a small slit, placing a frond inside the slit, and then gently closing it up again. How do they look? Are they realistic enough to pass as little carrots? 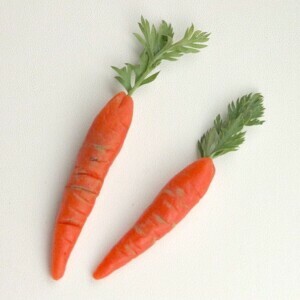 My Marzipan Carrots were a bright orange, but to be fair, the real carrots in the picture were quite a light orange- which makes the difference more extreme. The fronds and the ‘dirt’ help make them look like the real thing. And the best part?… you can eat these dirty little carrots. They taste like an almond confection. 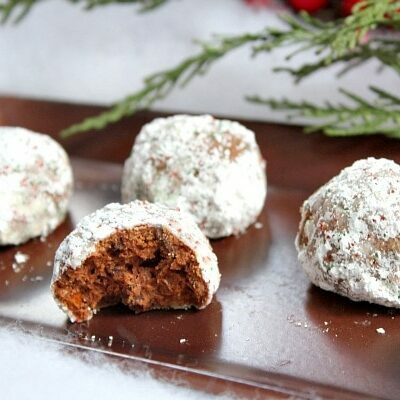 I used these carrots to top my Mini Carrot Cake Cheesecakes. They looked so cute, and they were a big favorite for Easter dessert. Tint marzipan with orange and red food coloring, a drop at a time, to reach desired color. Divide the tinted marzipan into 12 pieces (cover with plastic wrap or place into a zip baggie when not using). Shape each piece into a ball, then roll into logs, tapering 1 end, to resemble carrots. 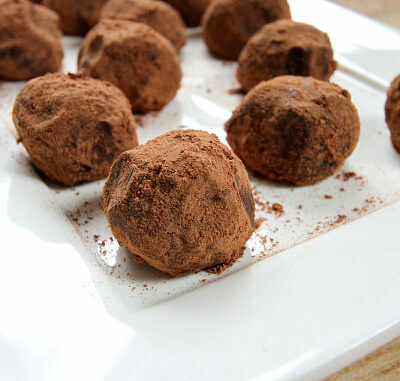 Dampen the edge of a paring knife and dip into cocoa powder. 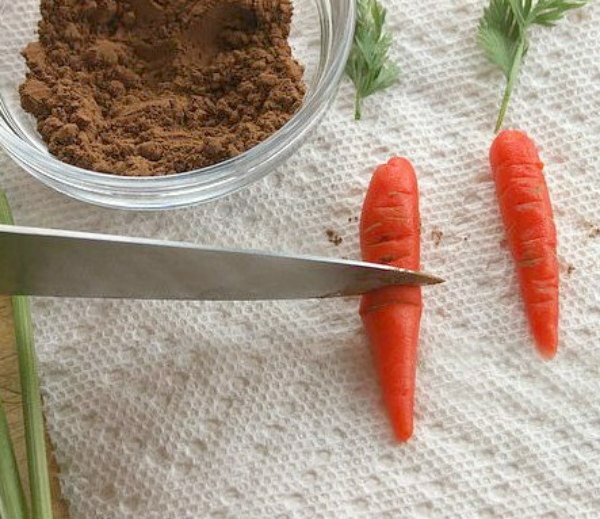 Make tiny indentations in each carrot with cocoa powdered knife edge to create texture that resembles a real carrot (the cocoa adds a dirt-feel to it). Carrots will keep, covered, for up to 1 week. When ready to use, cut a slit into the end of each carrot and slip in a carrot frond. Gently push closed to hold together. 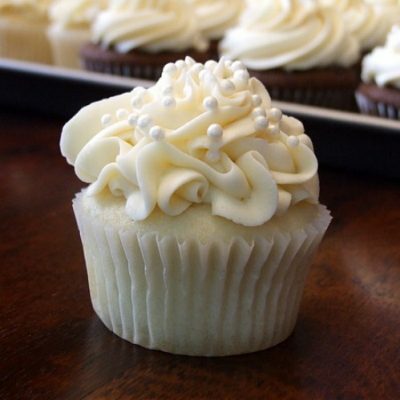 Use carrots to decorate cupcakes, cakes, cheesecake, mini-cheesecakes and other pastries. Marzipan can be found in the baking aisle of most supermarkets. 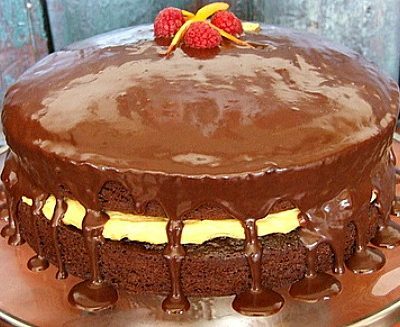 Gel-paste food coloring can be found at craft and baking stores. It's much easier to work with than regular food coloring and you need only a little to result in bold colors. You may also cut marks into the carrots and then brush on a bit of cocoa powder with a small paintbrush. Those are really, really cute! They look so delicious. Love the “dirt”. GReat job. That is fabulous! They really do look real. That cocoa dirt is an inspiration for achieving a just-picked look. I will bookmark these for my next carrot cake. 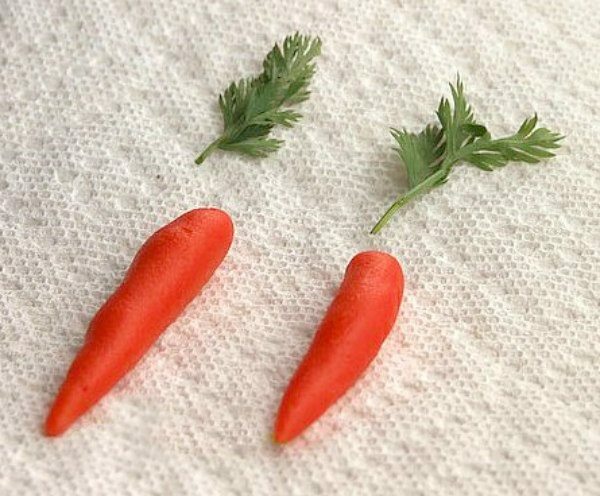 They do look like real carrots!! This is amzing, I’ve never done anything with marzipan before, you make it look so easy that i think I could do this!! Your carrots turned out perfectly! Good job! Wonderful job! They look incredibly realistic…I’m amazed how simple it was to make them. Thanks for the pictorial! You’re so ready for Easter! Gorgeous! 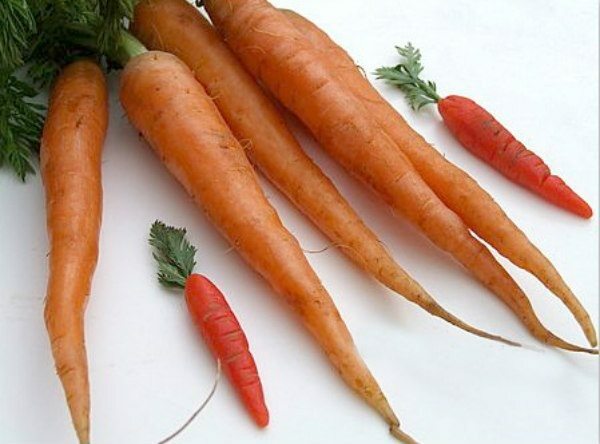 They really look like original carrots! Haha They really do look realistic!Like baby carrots! I wish I got that much done when I was working out!! I wouldn’t mind it quite as much. I LOVE your marzipan carrots. They are seriously adorable!! Awesome- I just bought a packet of marzipan carrots while on vacation in Austria- I love marzipan but have always been intimidated working with it myself. Thanks for sharing you tips- they look too damn cute.